Breakfast is an important meal to have. Breakfast skippers in one study were by about 14 % more likely to have a higher body fat percentage and higher BMI values and waist circumferences (1). Mediterranean breakfast foods vary depending on which region of the Mediterranean. But for the most part, they are quick and light. 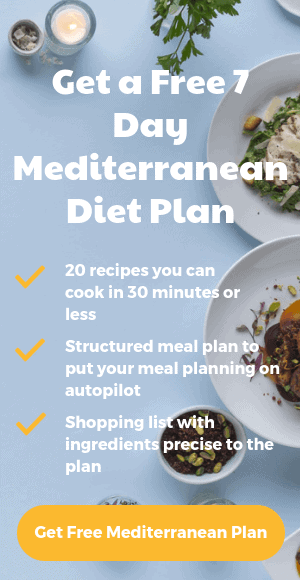 By sticking to Mediterranean principles such as lots of whole grains, fresh fruit or vegetables, and a source of protein (usually in the form of diary), you can easily stay full up to lunch. With a nod to Italian influences, adding basil to your scrambled eggs is definitely worth waking up for. Spinach and tomatoes also make a great substitute for bread. Eggs are great if you’re looking to lose weight as they score highly on a scale called the Satiety Index, which measures the ability of foods to induce feelings of fullness and reduce subsequent calorie intake (2). Get the Basil Scramble with Spinach recipe here. Tomato and watermelon make for a perfect light salad. Watermelon is a surprisingly healthy fruit. It has a high water content and also delivers many other important nutrients, including vitamin C and lycopenea, a plant compound that has been linked to improved heart health. Get the Tomato and Watermelon Salad recipe here. A super easy, yet delicious and filling breakfast to start your day. Oats are one of the healthiest grains you can eat. They contain large amounts of unique soluble fibres called beta-glucans, which can help lower cholesterol (3). Blueberries are a good source of vitamin K1, vitamin C and manganese. Get the Blueberry Oats Bowl recipe here. Bananas are primarily composed of carbs, and contain decent amounts of several vitamins, minerals, and antioxidants whilst contributing to improved heart and digestive health. Greek yogurt contains more protein than regular yogurt, helping you feel fuller for longer. Get the Banana Yogurt Pots recipe here. Avocado is a rather incredible ingredient, it tastes like it should be utterly bad for you but it is full of some wonderful health benefits. Providing your diet with some good fats, it is thought to help reduce the bad cholesterol in your body. Avocado is also full of Vitamin E, which is a great anti-oxidant and a good for balancing hormones. It tastes great with fresh dill and makes a really tasty breakfast to keep you going until lunch time. Get the Avocado Toast with Seeds and Dills recipe here.